The Russian Hmeymim airbase had lost contact with the crew of the Russian Il-20 military aircraft late on Monday during the attack of four Israeli F-16 aircraft on Syrian targets in the province of Latakia. "Our reconnaissance Il-20 aircraft with a crew of 15 on board was carrying out a reconnaissance mission over the Idlib de-escalation zone to determine the locations of storage and collection of unmanned aerial vehicles that fly out of the zone and strike different areas of Syria," Russian Defense Minister Sergei Shoigu stated at a meeting with senior military commanders. Israeli F-16 jets attacked Syria under the cover of the Russian Il-20, assuming that the Syrian air defense forces would not act in this direction, Shoigu said. "Without warning, more precisely, with a minute beforehand, Israel's informed us of a strike they were planning to conduct; they informed us that they were striking objects in Syria. And then they attacked," the defense minister stated. 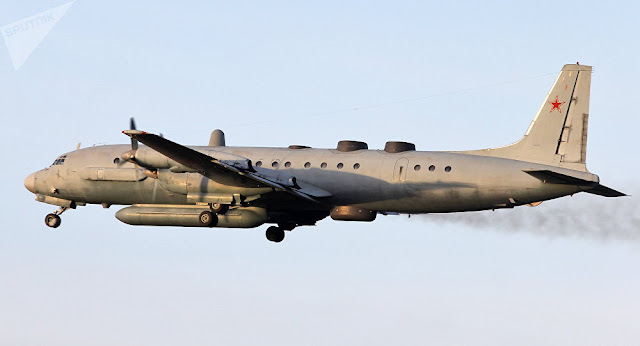 He stressed that the Russian Il-20 was shot down "as a result of the response from the Syrian air defense systems to the Israeli forces’ attack." The Russians have a point on this one. The Israeli's have a habit of attacking under the nose of operations being carried out by others. Do I have a problem with it? Actually no. Seems pretty smart from a tactical perspective. Accidents can happen as we see here. Blame can be placed on the wrong party potentially escalating things. Syria is annoying on several fronts. The fiction of fighting for freedom of the Syrian people has died...as a matter of fact I consider that lie to be a deliberate information campaign launched by our own govt directed at the members of the public most apt to support our military. Trade routes? Yeah that's more like it, but I fail to see the gain in this mess. We're trying to do thru force of arms what China is doing diplomatically (and tossing around about the same amount of money without the loss of lives) without setting the entire region on fire. The only thing that's certain is that Syria is a chaotic battlefield, that Turkey/Russia/Syria/Iran have already setup a "semi partition" of that country that they can all agree on, and finally we have somehow fallen into the weird position of SUPPORTING freaking ISIS. Syria is fucked beyond description and it appears that our strategy has failed once again...as tragic as this shoot down is, they're still achieving their goals.